Download the Protecting Your Land with the Enhanced Conservation Tax Incentive Brochure (PDF). 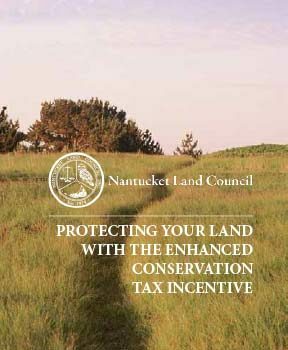 One of the primary land preservation tools used by the NLC in cooperation with conservation-minded Nantucket landowners is the Conservation Restriction (CR). A CR is a recorded legal agreement between an owner of land with conservation values and a nonprofit group, such as the Land Council, or governmental entity that always will protect that land. Each CR reflects a unique parcel of land and its landowner’s wishes for the future use of the land. Allowing qualifying farmers to deduct up to 100% of their income. This is an excellent opportunity for Nantucket land owners who have ecologically significant parcels of property to take advantage of this tax program. The Nantucket Land Council holds a total of 89 Conservation Restrictions on over 1,400 acres of land throughout Nantucket, Tuckernuck and Muskeget Island. Please contact the office to learn more!